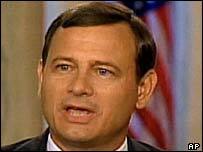 John Roberts, the new US Chief Justice, is a Republican with a solid conservative background. He is also the youngest chief justice in 200 years and could be at the helm of the Supreme Court for a significant period of time, setting its tone for a generation. The 50-year-old worked in the justice department during the Reagan presidency and was a deputy solicitor general under President George Bush senior. After a successful career as a private lawyer, he was appointed judge for the District of Columbia appeals court two years ago. He was part of a three-judge panel that ruled that controversial military tribunals at Guantanamo Bay, Cuba could go ahead. Conservatives will be pleased with Mr Roberts' record on abortion, church-state issues and the environment. He has successfully argued that government-funded doctors and clinics cannot talk to patients about abortion. He has also supported prayers at school graduations and sought to criminalise flag burning, according to the American Civil Liberties Union. In 1990, he co-wrote a brief urging the high court to overturn Roe v Wade, the watershed 1973 case guaranteeing women the right to an abortion. However, during his 2003 appeals court confirmation, Mr Roberts said nothing in his personal views would prevent him from applying the precedent of Roe v Wade. "My own personal views would not be relevant," he told the hearing. "My practice has not been ideological in any sense." At the time, his nomination to the appeals court drew support from both ends of the political spectrum. Some 146 members of the District of Columbia bar signed a letter urging his confirmation, including former Clinton administration officials. "He is one of the very best and most highly respected appellate lawyers in the nation, with a reputation as a brilliant writer and oral advocate," the letter said, praising his "integrity and fair-mindedness." Born in Buffalo and raised in Indiana, Mr Roberts graduated from Harvard Law School with flying colours in 1979. He was a former clerk to the late Chief Justice William Rehnquist before serving in the Reagan administration. He has argued before the Supreme Court 39 times as a private as well as a government lawyer. Before being lined up to succeed Chief Justice Rehnquist, Mr Roberts had been nominated to fill the Supreme Court post left vacant following the resignation of Justice Sandra Day O'Connor in July 2005. Mr Bush said Mr Roberts had "earned a reputation as one of the best legal minds of his generation" who has "earned the respect of people from both political parties." Mr Roberts and his wife, Jane, a lawyer, have two adopted children - five-year-old Josie and four-year-old Jack.